At its heart, this book is an examination of how a new structural material – mass-produced steel – came to be first applied to the buildings of one of the world’s great cities. The focus is evolution and change in London’s buildings and architecture in the late Victorian and early Edwardian period; its emphasis is unashamedly constructional. A great deal has been written about the shape, style and ornament of metropolitan buildings of the period, but comparatively little on their structural anatomy and physiology. Jonathan Clarke's book provides an unprecedented overview of an important era in construction history - the birth of the modern construction industry. ... this book contains material to delight anyone with a more than passing interest in theatre design and construction. ... Read the full story in Jonathan Clarke's splendidly illustrated, delightfully readable pages. There is an abundance of photographs and drawings, mostly in colour, that make browsing a pleasure but also complement the narrative. ... It is no exaggeration to say that this book is a ground-breaking study that encourages us to look at many London buildings in a different way. It is one of the most important books to be published on the history of structures in the last 50 years, filling an enormous gap in the literature. Another sumptuous book from the English Heritage stable! ... We must therefore be thankful to Jonathan Clarke for assembling and illustrating such a comprehensive selection of significant steel buildings. Not only is this a book with resonances belied by its title, but a handsomely produced and generously illustrated one as well. The book is a very well researched, interesting read. English Heritage have done the author proud and the book is a splendid object in itself, well designed and superbly illustrated. ... Clarke writes clearly and well and sets out the technical issues with admirable clarity. His book will certainly be required reading for anyone interested in construction history, but really it deserves to ve ready by anyone interested in 19th and 20th century architecture. ... The quality of production is excellent throughout. ... this book ... deals thoroughly and very readably with a subject that has not hitherto received the attention it deserves. The detailed and yet very readable text is supported by over 350 excellent illustrations in black and white and colour. This valuable book fills an important gap in our understanding of Victorian and Edwardian design and construction. Jonathan Clarke does what too few architectural historians manage to do - that is, get behind the building's facade and really confront its structure. To do this one needs, as well as plans, good sectional and construction drawings, and those this book has in quantity ... it offers a rich review of an architecture that, for all its historicist expression, was as modern as the dated building regulations would allow. This is a fascinating story which he tells and illustrates superbly. ... this book will undoubtedly remain the key text on its subject, for both historians and anyone concerned with the structure of existing buildings. 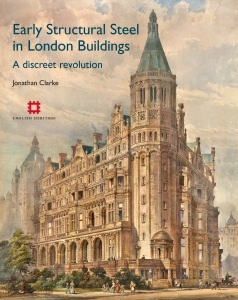 This fascinating, profusely illustrated book on early steel structures will enable the reader to look at the important legacy of late Victorian and Edwardian buildings in London in a totally different light.